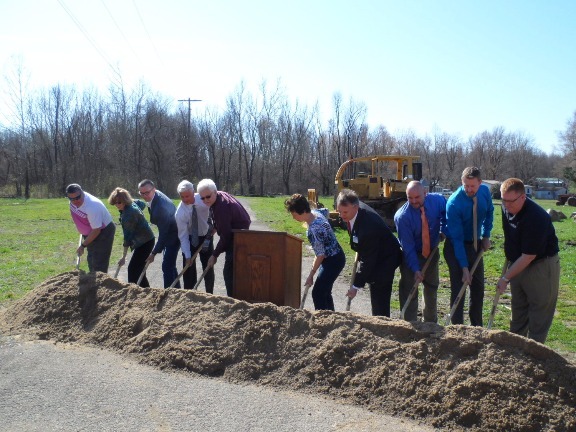 ​​The City of Central City held a groundbreaking ceremony for the Lu-Ray Park Amphitheater project on March 15, 2016. The construction of the amphitheater is Phase I of a multi-phased project to develop Lu-Ray Park on the site of the historic Lu-Ray Hotel. The Lu-Ray Hotel was built in 1912 and was a major stopping point for travelers and workers on the railroad between Paducah and Louisville. Central City has been the recipient of Land and Water Conservation Funds (LWCF) and Recreational Trails Program (RTP) funds, as well as an allocation from the Felix E. Martin Jr. Foundation to be utilized in the development of the park. In addition to the amphitheater plans for the park, which will be located in downtown Central City, include a restroom/concessions facility, picnic pavilion, walking trail, and a veteran’s memorial. PADD staff assisted the City with the submission of proposals for LWCF and RTP funding. The construction of the amphitheater is anticipated to be complete by the summer of 2016.